With the increasing awareness of eye health around people, the willingness to stare at eye-straining screen is far outweighed by the desire to immerse in soothing or energetic music on a variety of mediums. As a result, the occasion to get music off source videos, no matter saved in MP4 or FLV, becomes quite a common thing. But how to extract audio from video files? To better enjoy music on iPod, iPhone, MP3 player or save the audio as ringtone on smartphone, you can choose to transfer video to MP3 audio format as it spans all digital media and boasts a compact file size. Well, you go about everything legally and still hit roadblocks. You don't know how to convert video to music MP3. To tell you the truth, all you need is a professional music converter (a free one is always preferred). Best Mac music converter freeware to convert MP4 MOV AVI MKV to MP3, AAC, iPhone Ringtone audio format for iPhone iPad Android playback with no quality loss. 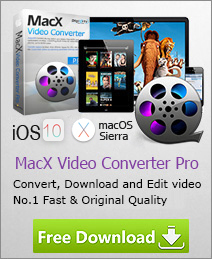 Here, MacX Video Converter Free is worth your try. As a professional yet free music converter for Mac operating system, it has gotten a good word of mouth over the years since this free music MP3 converter software enables Mac users to free convert any video to MP3 format on Mac OS, like MP4 to MP3, AVI to MP3, WMV to MP3, MOV to MP3, YouTube to MP3 and more. It deals with any kinds of video formats you throw at it and converts them into MP3 format the Mac can handle. Whether you are longing for a piece of quality-lossless music or anticipating a lightning speed while converting your video to music MP3, this free music converter that works under Mac OS is up for the tasks for all music lovers. The free music converter for Mac interface is straightforward. After you get this music converter freeware downloaded on your Mac El Capitan, drag and drop video files to the program. Or click "Add File" to locate the files you want to convert. In the output format area, select MP3 as output video format from "to Music" category. In addition, you can also choose to convert video to MP4, convert YouTube to MOV, convert Vimeo to MP3 soundtrack, convert MKV to AVI, FLV to MP4, etc. according to your own needs. Click "Browse" button in output setting area, select a destination folder in the dialog box that opens. This free music converter for Mac extracts audio content from video formats such as AVI, FLV, MP4, MOV, M4V, WMV, MPEG, MTS, M2TS, etc and convert video into MP3 format easily. After finishing all the settings, all that's necessary is to click on the thumbnail to begin to free video to music MP3 conversion on Mac with the "RUN" option on this easy Mac music converter freeware. This Mac music soundtrack converter worked as advertised, and we didn't encounter any problems in testing. After finishing video to MP3 conversion, you can play your MP3 music on any compatible media players or portable devices, such as iPod, iPhone or iPad. For advanced users, the pro version of this free music converter for Mac, MacX Video Converter Pro, offering numerous types of output options, such as iPhone XS/XR/X/8, iPhone 7/7 Plus, iPhone 6s/6s Plus/6/6+, iPad Mini 4/Air 2, iPad Pro, iPod Touch, Apple TV, Android phones, etc in addition to music MP3 format. Its well-received online video audio downloading feature lets you easily download YouTube HD videos and batch download videos from Facebook, Dailymotion, Vimeo, Vevo, Myspace, Instagram, etc. 1000+ video audio sharing sites, and convert videos to MP3, MOV, FLV, etc at one stroke as you like. 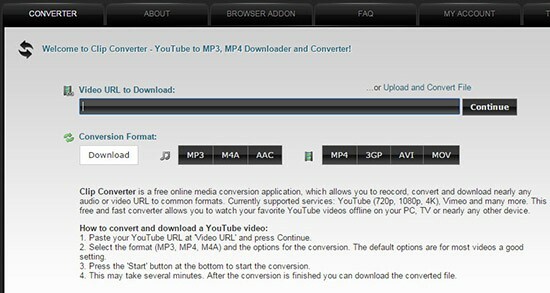 Besides using the free music converter to convert YouTube to MP3 AAC music format, you can also choose to free convert music to MP3 sound online with Clipconverter, which allows you to free download and convert YouTube to MP3, M4A, AAC, etc. audio formats in two steps only. Step 1: Download or upload YouTube files from YouTube or local folders. 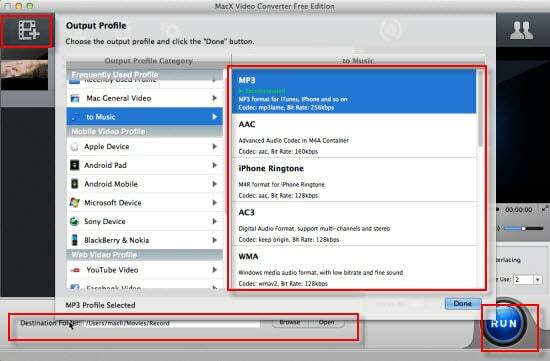 Step 2: Choose the output audio formats from MP3, M4A, AAC. And then click "Conversion". Job is done. Here is a list of the 2017 leading free video converters available both on Mac and Windows. With any of the video converter free downloaded, you can convert HD/4K clips, videos to MP4, HD MKV, MOV, MTS, AVI, MOV and more. If you have downloaded some YouTube videos or audios to Mac and want to extract MP3 from the video, then this tutorial will show you how to convert Youtube to MP3 on Mac with a powerful free music converter for Mac. Download free MP3 music converter for Mac to free convert all video files to MP3 music for playback on iPhone, iPod, iPad, Blackberry, Android etc, such as MP4 to MP3, AVI to MP3, WMV to MP3, MOV to MP3, YouTube to MP3 and more.